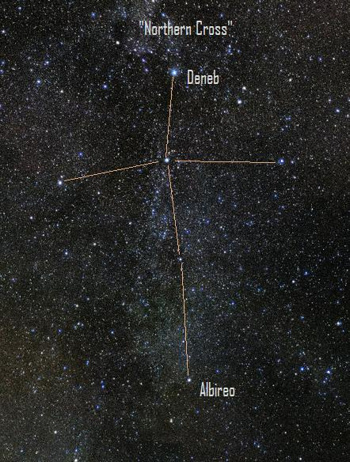 The star Deneb marks the top of the Northern Cross, and the star Albireo marks the bottom. Tonight you can find the Northern Cross shining fairly high in the west at nightfall, as seen from mid-northern latitudes. It sinks downward during the evening hours, and stands proudly over the west-northwest horizon around mid-evening. Here’s another look at the famous Northern Cross. It’s part of the constellation Cygnus the Swan. Photo via Flickr user Janne. The Northern Cross is what’s known as an asterism. 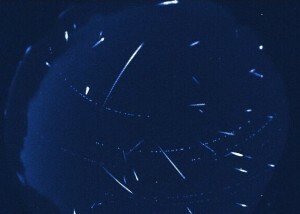 In other words, it’s not a constellation but simply a noticeable pattern of stars. It’s part of the constellation Cygnus the Swan. As an added bonus, if you have a pair of binoculars, break them out this evening and point them toward the Northern Cross and its larger constellation Cygnus the Swan. In this direction, you’ll find a part of our Milky Way galaxy that is called the Cygnus Star Cloud. 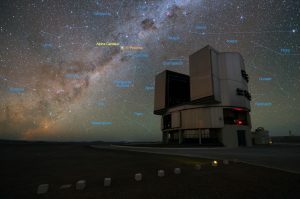 It is part of the spiral arm of our galaxy that also contains our sun, and you should be able to pick out stars from it if the night is clear in your area. By the way, we get many questions from people in northern latitudes about if and when they can view the Southern Cross in their portion of the sky. The truth is that unless you live close to the tropics (Hawaii, or the southernmost parts of Texas or Florida for those of us in the U.S.), you will not be able to view the Southern Cross, also known as the constellation Crux. To find out how to locate Crux in Hawaii at this time of year, look here. 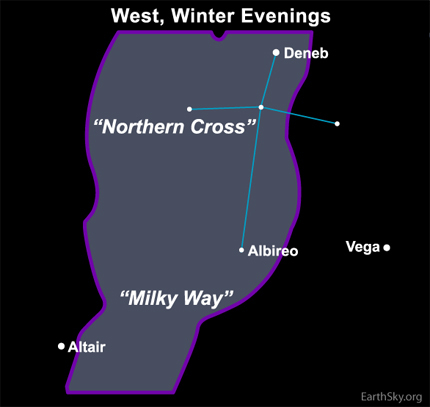 Bottom line: Learn to recognize a famous star pattern known as the Northern Cross, which stands upright over the west-northwest horizon in December. 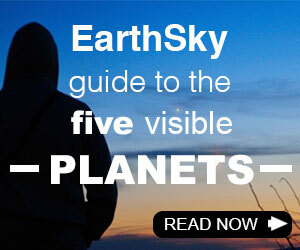 EarthSky lunar calendars make great gifts for astronomy-minded friends and family. Going fast!